Are you on the hunt for some time-proven garden gifts? Do you have a special gardener on your holiday gift list this year? Perhaps you are creating your own wish list? Whichever it is, the following are some of the most sought after garden gifts available this season. Even though the winter season tends to be slow for gardeners in most zones, a true gardener is always dreaming about plants and springtime. Encourage their passions through the following gift categories. Wreaths - Not only a Christmas item, wreaths will dress up any home environment. Bring the outdoors in with a traditional evergreen wreath decked with holly or pine. Also consider the wide assortment of silk flowered and artistic style wreaths, for a more lasting garden gift. Intended for both the indoors and the outdoors, many gardening gift catalogs offer compact weather stations including thermometers, barometers, and hygrometers. These are perfect garden gifts for year-round practical entertainment. Indoor Bulb Gardens - Plow & Hearth, along with other gift catalog companies like Norm Thompson, provide forced bulb containers mailed to your home once a month. 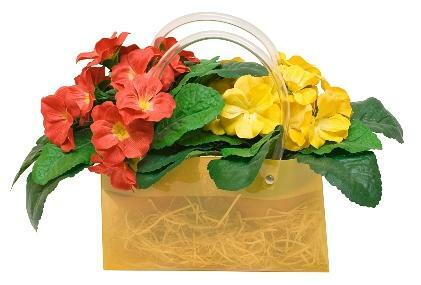 What a great way to provide colorful flowers during any season! You can also make your own with a decorative planter, potting soil, and bulbs that have been chilled and are ready to bloom. Indoor Terrarium - These allow a gardener to bring a little garden inside. Any style miniature greenhouse will allow a garden lover to drag out the growing season . . . just a little bit longer. Dress up your garden trees with these great items from Plow and Hearth. You will find forest faces, wildlife figures, and holiday items all to turn your tree's trunk into a whimsical work of art. These are an inexpensive unique gift for less than $20 a tree. Bird Feeders - Available almost anywhere garden and yard supplies are sold, start this winter by giving your feathered friends their own garden gift. Bird Houses - From the fancy to the basic, either as a garden gift for a friend or for your own yard, bird houses are both decorations and practical living spaces. They are vailable in versions from the fancy bird mansion to the rustic cabin, so you can find a perfect fit for your garden's style. Fill a fun basket with all the garden basics. Almost every avid gardener will need replacements of items such as gloves, aprons, pruners and shovels. Also consider a gardener's tool bag with a few selected new tools added for fun. These are quite handy for making sure you always have your gardening necessities available at every key moment. Gift Certificates - Let them start planning for planting season with a gift certificate at a local nursery or seed and plant catalog. Garden Clogs or Boots - The market has exploded with fashionable garden shoes, to be worn on and off the dirt. If your gardening pal hasn't recently updated their yard footwear, this could be a much appreciate gift. Hats - A wide brimmed water resistant hat is a practical garden gift. You can find them at most outdoor apparel retailers, like REI or Sierra Trading Post. Burpee: The Complete Vegetable & Herb Gardener : A Guide to Growing Your Garden Organically (Hardcover) - For anyone interesting in learning more about organic gardening. Making Gardens Works of Art: Creating Your Own Personal Paradise (Paperback) - Learn tricks to take your garden from ordinary to amazing. Square Foot Gardening: A New Way to Garden in Less Space With Less Work (Hardcover) - A highly rated book for those with limited yard space who love to garden. The Winter Garden: Create a Garden that Shines Through the Forgotten Season (Hardcover) - Stop dreaming and get out and create a garden that lasts through even the harshest season. Sunset Gardening Books - Find the one for your area and these books will deliver consistent quality advice on plant descriptions, care, and maintenance specific to your zone. As you can see, there are garden supplies, accessories, and instructional materials that any gardener would love. Consider what your favorite gardener would most appreciate, and that will guide you to the perfect gift choice.